Good tools are worth their weight in gold. I am a firm believer in having the right tools for the right job. This is especially the case with spinning. I bought the Fricke Heavy Duty Adjustable 4-in-1 Skeinwinder from Carolina Homespun a few months ago because I was spinning more and more, and mystery yardage doesn’t work for me. This is especially true if I’m spinning for a lace project. The skeinwinder has been worth it’s weight in gold. Last year, I bought a Swedish Bobbin Winder and a gross of plastic bobbins so that I didn’t have to buy a million Schacht bobbins (which are $32 a pop). This has worked really well, and the SBW is a terrific tool. That said, the downside is this: using it to wind 3488 yards of cobweb weight singles will result in some serous shoulder fatigue. 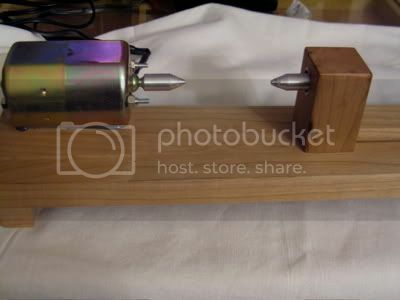 I looked online, and there has been an eBay vendor selling the electric bobbin winders for about 1/3 of what Schacht is charging for theirs. This is tempting. I e-mailed the auction to Colleen to see if he was asking an insane amount of money for the thing, and she confirmed that it was fine, and then proceeded to win the auction. She brought it over for me to play with, and it went at light speed. I called Colleen and let her know that it wasn’t working the way it should, and if she could find a fast/slow switch on the thing. It has a sewing machine engine, so there should be something, I say. Colleen takes it home and has the resident Electrical Engineer take a peek. He switches it to “slow” mode, and now it works brilliantly. It’s much faster than the hand-crank tool (which I’m still using for small amounts of spinning), and it saves my back. Even better- it smells like a sewing machine when it’s running.